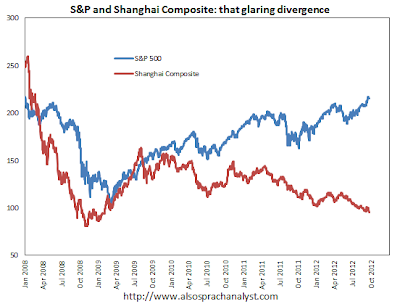 China's Stock Market Continues To Plunge: Buying Opportunity? Want to hear something very, very strange? I think it's a good time to buy certain Chinese stocks. Take it easy. 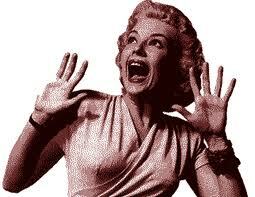 I knew that would be your initial reaction. The Chinese stock market has been absolutely annihilated over the past two years. While the American market has essentially moved straight up, the Chinese stock market has essentially moved straight down. After falling another 2% overnight due to some terrible manufacturing data, shares are now closing in on the lows reached during the financial crisis in 2008. 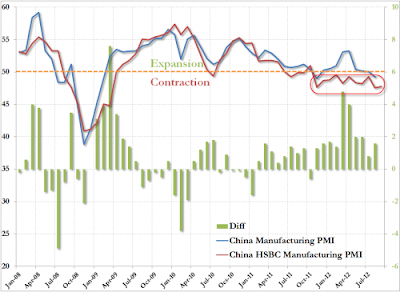 The market in China has been going down is for good reason (I have no explanation for why the American market has levitated back up into bubble territory). 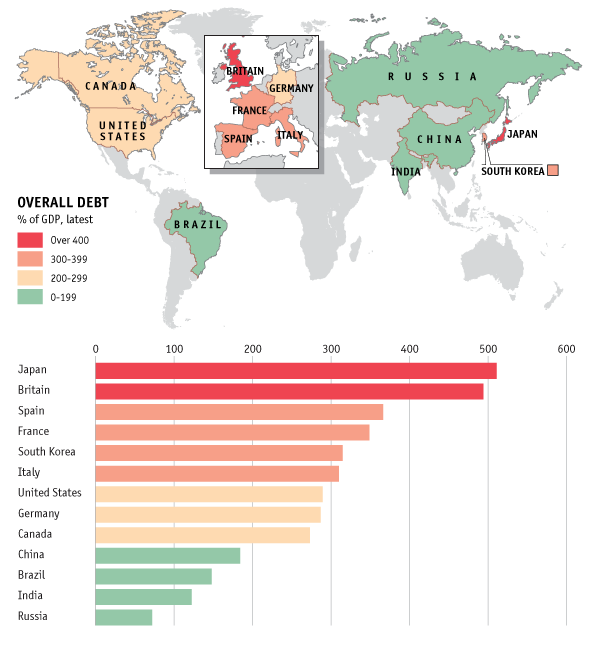 The global economy has slowed significantly due to the European debt crisis. Europe is China's largest trading power and their demand slowing has a tremendous impact on China's growth. Their real estate bubble also appears to be finally popping. Estimates show that real estate directly impacts close to 25% of the GDP in China. I came across this great map this morning, which shows the total debt to GDP of the largest economies around the world. You can see that Japan and the UK are the worst offenders. Many financial observers (including me) believe that these two countries will be next in line for a sovereign debt crisis. You'll also notice the developing countries in the chart marked in green. Brazil, Russia, India, and China (the BRIC's). These countries have much stronger balance sheets than the rest of the world. It means these countries have more room to stimulate their economies through government spending programs. I don't agree with this strategy (because it leads to your country turning red on the graph and setting you up for a depression which is coming for Japan, the UK, and the US), but its just what politicians do. Everywhere. More stimulus means more growth in the short term, which is a positive for share prices. 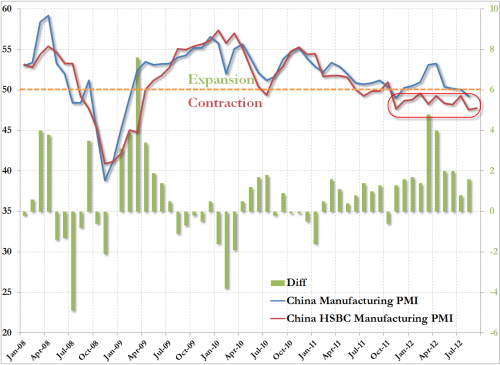 I think a large scale stimulus or money printing program is coming from China as their economy continues to slow down. They don't have an insane central banker that only cares about the level of the stock market, like America's Ben Bernanke, but they have a government that cares a great deal about growth and keeping their people working. If this means building bridges to nowhere and empty cities they will do it. Also remember that China's people do not have a safety net that exists in the United States. They do not have 99 weeks of unemployment, social security, medicare, disability payments, food stamps, low income housing vouchers, and all the other programs that indefinitely support those that either cannot or just chose not to work in America (close to 25% of the country today). This safety net is what has given Americans the psychological belief that they can spend every penny they earn and even borrow what they have not earned to purchase nice things today. There is no need to save for the future in America because politicians have promised that the government will always take care of everyone. If the Chinese even implemented a fraction of this type of program (again - I not think they should, I am only speculating about what they could do) it would unleash an enormous amount of consumer spending in China. This would create a surge in their GDP. Remember, America built itself as the "largest" economy in the world based on borrowing and spending. It is now in the early stages of collapsing on itself due to this economic plan, but it has been a really good 40 year ride. 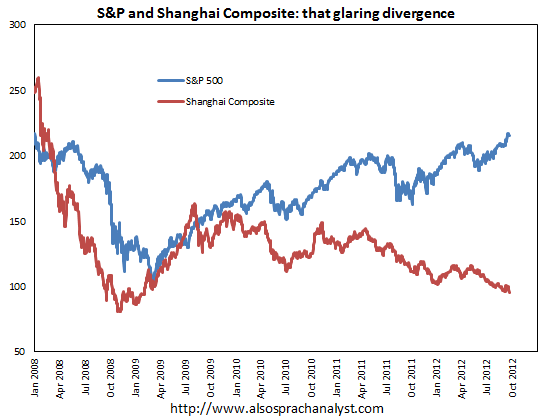 Where are Chinese stocks going in the short term? Probably lower. But I think they will be much higher in 3 years and sentiment is a rock bottom levels. Every investor around the world only cares about purchasing as much Apple stock as they can possibly own. The thought of buying in China is now an afterthought. That is my favorite time to buy. While I disagree with just about every policy decision Obama has announced since the day he took office, I can say that Obama is one of the most intelligent and well spoken people in the country. My mind knows that everything he says is completely wrong and the worst possible thing for our country, but when he speaks it sounds really good. Even though he is a terrible President, he is an incredible politician. You can't say the same for Mr. Romney whose political campaign recently has been a walking disaster. It would be amazing if we re-elect a President with true unemployment somewhere close to 20% and the economy in the middle of the second great depression, which began back in December 2007. However, Obama only has had to sit back and watch Romney self-destruct. Here's Jon Stewart last night, a die-hard Democrat, having some fun with Romney's latest "incident." When an American decides they want to purchase a home they most likely begin by heading down to their local bank to find out how much they can borrow. The bank then provides them with loan information based on their financial situation that they can then go out and use to "shop the market" to find the best rates and terms. Mortgage rates are determined based on a spread against the ten year treasury bond. A treasury bond is considered "risk free" in terms of default because it is issued by the federal government of the United States, which historically has been considered the most likely entity in the world to pay back what they owe. Thus the ten year bond is the benchmark and the current "spread" in the open market, or what you pay above the ten year bond, is how your mortgage rate is determined. Historically this spread has been between 1.5% to 2%. This means that if the ten year yield is 1.85% (it is as of this morning), in a normal lending environment you would pay between 3.35% to 3.85% on your mortgage. Something very interesting has happened since the financial crisis hit in 2008. The mortgage market in America has essentially become nationalized or government owned. Close to 100% of the loans that are created today are either purchased or insured by a government entity (FHA, Fannie, Freddie). In addition, the Federal Reserve began buying these government owned mortgages during their first QE program, further reducing the risk to everyone in the market. In anticipation of the coming announcement of QE3 investors have been heavily purchasing mortgage bonds in the open market. As they purchase bonds, demand for bonds rises, and the rates on bonds fall. This has had the effect of bringing the spread down from over 1% in June to just .22% as of this morning. This means there is essentially no difference in the price of a mortgage bond vs. a treasury bond in the open market. They are considered equal in terms of risk. This shows the current level of insanity in the financial world we live in today. It is obvious to even a 6 year old child that someone borrowing money for 30 years on a home is far, far, more likely to default on that debt than the federal government of the United States. The next question is, how low can mortgage rates go? With the Fed saying they plan to purchase $40 billion (or more if needed) mortgage bonds per month forever and there being a limited supply of mortgage bonds in the world, it is possible that the interest rates on mortgage bonds in the US could move well below the rate on treasury bonds and even begin to approach zero. Can you see the lunacy in this situation? At some point in the future the Fed will have to tighten monetary policy. In order to tighten, they must do the opposite of what they are doing today. Instead of purchasing bonds in the open market and flooding the system with cash, they sell bonds into the market and sop up the cash. What is going to happen to the interest rate on mortgage bonds when the Fed must become a seller? The exact opposite of what is happening today; investors will front run the Fed by selling into the market instead of buying. What will happen to the rates on mortgage bonds if the government stops purchasing and insuring 99% of all new mortgages created? The exact opposite of what is happening today as mortgage originators knowing they cannot offload the toxic mortgages to the taxpayer will tighten their lending requirements significantly. The current mortgage program in America today would make any communist country blush with jealousy. The Fed always tells us it can sell their assets back into the market in a matter of minutes if inflation begins to run out of control. The problem is that when the market anticipates this selling they will dump mortgages into the market. This will significantly reduce the value of the Fed's holdings as their mortgage bonds become under water (ironic isn't it). They will be trapped with no way to sop up the liquidity. That part of the story is a long way away, but it is important to think about today when making investment decisions.